Our friendly weather man, Chris Parker (SSB Ch. 4045 at 6:30am), continued to forecast east and southeast winds through the Jumentos Cays and Ragged Islands. Since Rode Trip can only sail so far to windward (upwind) an east wind means that our starboard tack would take us on a course of 030 and our port tack 150. An east wind just about doubles our route to the Windward Passage, at least when departing from Hog Cay near Ragged Island. We put our minds together for some clever navigating and created our own opportunity…sailing north (again) in order to sail southwest. We’d stay on the banks on the leeward side of the Jumentos and Raggeds to minimize waves and make our way to the southern tip of Long Island. This would enable us to keep traveling (esentially a long first tack) and put us in an ideal jumping point to sail south on our 150 port tack. 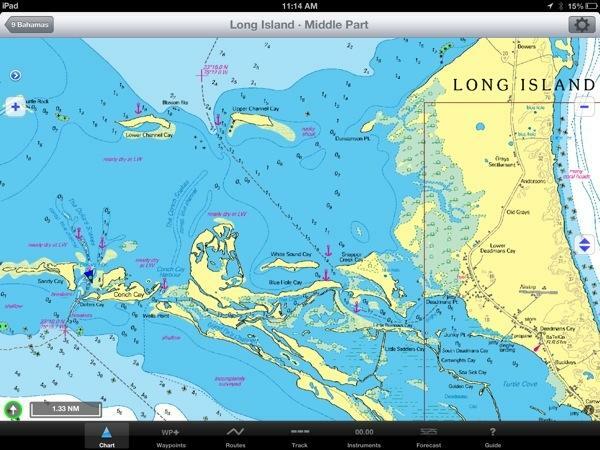 We departed Hog Cay for our first layover at Flamingo Cay, a distance of 43nm. We remained at Flamingo Cay two nights. We had to lay low during predicted two days of 25-30 knot easterlies. Remember that uncomfortable swell making a very rolly anchorage? Yup, that was here at Flamingo and we were not happy to have to sit out the weather. We were relieved when Parker’s forecast had lowered wind speeds for the second day, 20 knots east-southeast, which made for a quick 14nm sail to Water Cay. 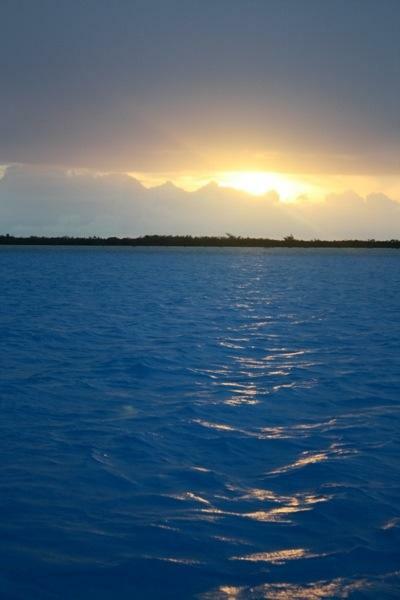 We anchored at the northern end of Water Cay and had calm waters all night. No such luck. What little wind there was, certainly less than 15 knots, was straight out of the east. Rode Trip struggled with this for hours plugging along at 2-3 knots along courses of either 030 or 140. We’d raised the full main (it had one reef throughout our Jumentos/Raggeds travels), the jib, and the stay sail. As the afternoon progressed the wind became shifty and light. At 1:30pm we were still 15nm for our destination and had just completed a whopping mile (tacking out and back at least 6nm to achieve this). Serendipity hailed us on the VHF to see how we were doing as they were ahead of us having a similar day. We were running low on daylight and needed to head straight east…the time was nearing to bite the bullet and start the engine. We’d last run the engine on March 30th for 0.8 engine hours to motor across Thompson Bay, Long Island to be anchored nearer the government dock. We’d done our ENTIRE Jumentos/Raggeds trip with no use of the engine. This had been 201.3nm under sail; including all anchoring under sail. We had started to joke that we’d have to at least turn it on to get the oil flowing once again. Reluctantly, at 2:13pm we fired up the Perkins 4108 to motor our remaining 15.6nm into Dollars Harbor. Getting inside would be tricky, we’d have to visually navigate around sandbars to keep to a narrow, deep water channel. And so with our sailing streak ended for now, we were happy to have an engine to take us safely into the harbor during daylight. After 3.5 engine hours we set the anchor at Dollars Harbor. It was strikingly beautiful! 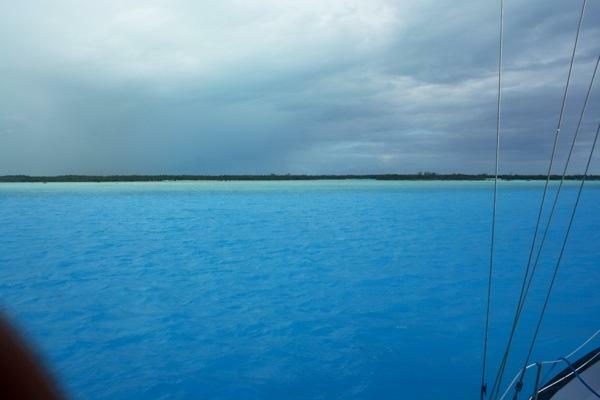 The brilliant blues were highlighted by the white sandbars. A rain squall moving through gave us a crisp rainbow overhead. This would be the perfect location for respite before our journey south. 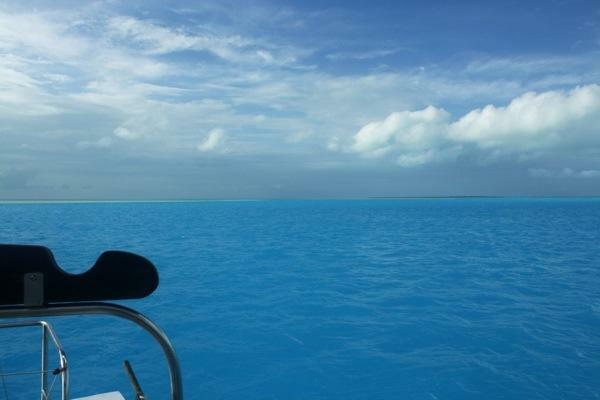 This entry was posted in Uncategorized and tagged 20130418, 20130421, bahamas, conch cay, dollars harbor, engine hours, jumentos cays, Long Island, sandy cay, water cay by stephanie. Bookmark the permalink. YIKES! wouldn’t get me in that water with all those sharks! Good for you brian-getting dinner like that! ENJOY KIDS! and thanks for sharing! !